For many, summer is the season when the lure of Moose Pond is strongest. Swimming in its clean, refreshing waters or ﬁshing in the still of the early morning delights us. The Moose Pond Association strives to be sure those experiences will be enjoyed in years to come. In this second annual newsletter, you can read about what we’re doing, both around the pond and under the surface, to maintain the good water quality that we know is so precious. You will ﬁnd articles that discuss the increased water quality testing and Courtesy Boat Inspection program, both paid for by your membership contributions. Additionally, we offer information about the upcoming Route 302 roadwork, ideas on how to minimize the environmental impact of your property, and an article on Moose Pond loons and the Audubon Society loon count program. Two years ago, the Lakes Environmental Association started taking core samples and studying the algae Gloeotrichia echinulata in the pond. Last year, additional testing included more detailed temperature recordings. This year, we have hired LEA to conduct testing for other kinds of algae. This testing, when conducted annually, will provide the ability to understand trends in Moose Pond water quality, both good and bad. 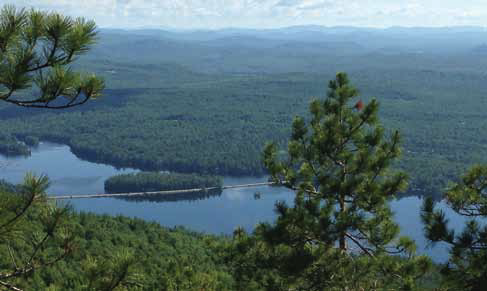 The testing will occur in conjunction with a number of other lake associations and in partnership with the new Maine Lake Science Center that the Lakes Environmental Association has established. We need to understand just how fast Moose Pond and other local lake water quality is being affected before negative trends become irreversible. The science center’s connection to the worldwide science community will be a great asset in helping us ﬁnd solutions to the problems we encounter. We want Moose Pond to be at the head of the list when help is needed. These stories and others are all in our newsletter. If you have ideas or stories to tell please let us know. More information is always available at our Web site: www.moosepondassociation.org. The mission of the Moose Pond Association is to do the following: “Maintaining and Improving the Health of Moose Pond.” Our best hope for helping the pond is an informed and caring public. We can all contribute to a cleaner lake, free of invasive plants, so please take a moment to read the news. We’ll count on your support to make Moose Pond a place for people to enjoy for all time.